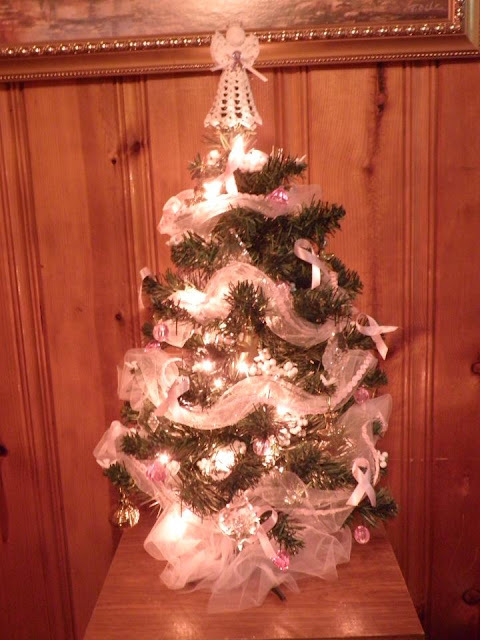 Pink Ribbon Tree for Sandy! As a lot of you may know my sister is a breast cancer patient and has been going through some pretty rough symptoms, treatments and procedures. She has always been called "Aunt Sandy Claus" by all the nieces and nephews in our family and was well known to go over-the-top on Christmas...whether it be decorations, gifts or sweets. The last year or so she was not able to put up a tree and her standard decorations. My husband and I offered with the assistance of our adult children to go and put up her tree and decorations for her but she just wasn't feeling well enough to even do that. So we got a little tree from Candy Messer at Pier 17's Whistler's Catch gift shop and we decorated it as a pink ribbon themed tree...and this is a picture she took of it...so glad she likes it! Good Day and welcome to my Den! Once again it is time for our Pride to pounce through our creations and bring you the PURRfect projects for the Holidays! So please join me and the rest of the Pride of Just a Few Friends! Our WILD adventure for this month is to create a Christmas Ornament. As you join us in our quest today and hop along with us you will be introduced to 13 different styles! 13 different inspirations to create something beautiful to enjoy your Christmas...If you landed here by chance, visit Elsa's Blog so you can hop along from the beginning and not miss a thing. BTW...did you all know that a mother lion will move her cubs and den site several times a month...so I guess it is cool that we have a blog event every month!! !